A judge ruled Wednesday there’s no legal basis to the claim that representative-elect Raquel Terán is unfit to serve in the Arizona Legislature because she is not a U.S. citizen. The case filed by Alice Novoa, who lives near Douglas and who in 2012 filed a similar lawsuit that was dismissed on a technicality. During the 50-minute hearing, Terán’s attorney, Andy Gaona, provided copies of his client’s birth certificate to the judge and Novoa. Gaona told the judge this is a case of birtherism based on racial animus, in addition to failing on two procedural issues. Novoa, who was representing herself, often irritated Maricopa County Superior Court Judge Connie Contes for interrupting her and going on unrelated rants about her views on Terán’s family and work in activism. Novoa went on to say that, if the birth certificate is real, Terán’s is still not a U.S. citizen because she is an “anchor baby” of “illegal alien” parents from Mexico – an allegation she provided no evidence of – a viewpoint common among many anti-immigrant activists. The U.S. Supreme Court ruled in 1898 that citizenship is granted by the 14th Amendment to the U.S. Constitution to everyone born in the country whose parents are not diplomats of a foreign nation. Novoa provided no proof the birth certificate was invalid. 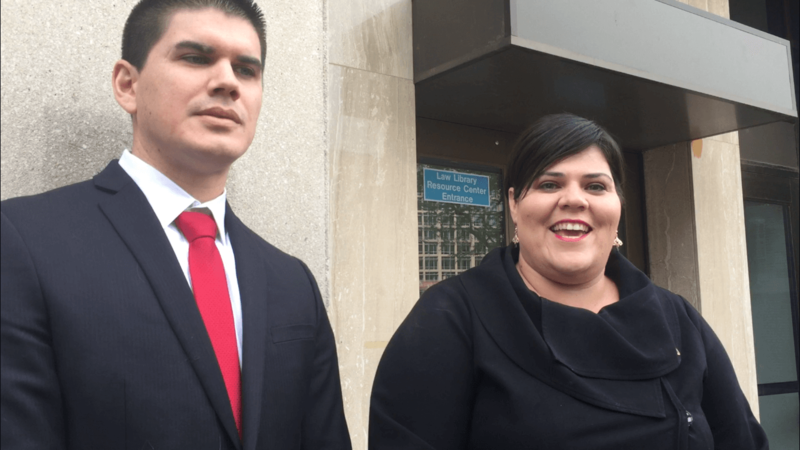 The judge dismissed the lawsuit and said she will consider requiring Novoa to pay Terán’s attorney fees and costs. Terán stepped off the courtroom with her navy blue U.S. passport in her hand. She brought it to be prepared, she told the Arizona Mirror. Community members and some Democratic legislators attended the hearing in support of Terán. Before the hearing began and later outside the courtroom, Novoa spoke to them. While she stepped away to the elevator area, Novoa held a book of the Arizona Revised Statutes and two large binders to her chest. She turned to Rep. Isela Blanc, D-Tempe. “I’m coming after you very soon, very soon,” Novoa said. Blanc was first elected to the Arizona Legislature in 2016 and was formerly an undocumented immigrant. Blanc, whose district includes parts of Tempe and Mesa, later told the Mirror she has nothing to hide. “I’ve been working hard for all Arizonans, which I know is something Representative-elect Terán is committed to, and that’s what matters. That’s the most important thing,” Blanc said. The day after she filed the lawsuit against Terán, Novoa filed similar lawsuits in federal court. Without proof, Novoa is challenging the eligibility to hold office on grounds of their U.S. citizenship of Democratic Congressman Raul Grijalva; Nicolas Pierson, the Republican Grijalva defeated this year; and Lea Marquez-Peterson, the Republican candidate for Congressional District 2. Grijalva was re-elected and Marquez-Peterson lost to Democrat Ann Kirkpatrick. Blanc called the hearing “appalling.” Gaona said there were no words to describe it. Terán said she was angry and frustrated, and said it was a waste of the judge’s time and the county’s resources. “I’m happy this is over,” she said. Smiling, Terán said is moving forward and excited to begin the legislative session in January. She also pushed back against Novoa’s views on birthright citizenship. Google Alice Novoa and read about what a nut case she is! The courts need to finally bar her from lodging frivolous lawsuits.